Paprika has an extremely high concentration of vitamin A, which is great for warding off dry eye symptoms. Other good news about paprika, it’s an extremely versatile ingredient- and just about everyone has it sitting in the spice cabinet. Try using paprika next time you cook. It’s awesome for boosting flavor- and nutrition! Get a dose of paprika by sprinkling it on potato salads, fish, chicken and eggs. You may have already heard that bilberry, a shrub closely related to the blueberry, is great for overall eye health and retinal diseases like macular degeneration. Well, it’s also particularly beneficial for dry, itchy eyes. Extracts from the bilberry fruit help to improve blood circulation, oxygen supply and tear gland function. Additionally, bilberries contain vitamin P and citrin, both of which help to decrease swelling and inflammation in the body; a common dry eye trigger. Experiment with bilberry supplements or tea made from bilberry leaves. However, be careful not to over indulge. Ingest no more than 220 mg of bilberry per day. Next time you’re tempted to rub those itchy, stinging eyes, try a spearmint eyewash instead. Simply boil about 10-12 leaves of spearmint in some water. Wait until the solution cools (at least 20 minutes!) and then use a clean face cloth to apply the wash to your eyes. Menthol, the active ingredient in mint, actually stimulates tear production and will leave your eyes feeling energized and refreshed. Plus, it smells amazing! Win-win. Chamomile is known for its cooling and anti-inflammatory properties. It soothes tired eyes and can help restore moisture. Another bonus? Drinking chamomile tea makes you feel sleepy and prepares you for rest, so it’s the perfect drink to sip on after a long day. So, there you have it; options for natural dry eye relief. 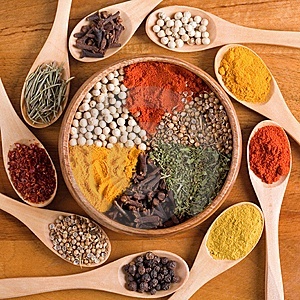 Of course, the above mentioned are merely a few of the wondrous herbs and spices that can alleviate dry eye pain. Other potential dry eye fighters include thyme, fennel, marigold and calendula. This article is a reprint from AllAboutDryEye.com, which is sponsored by TearLab Corporation and first shown by the SSF in “The Moisture Seekers,” SSF’s patient newsletter.